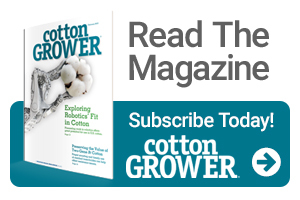 University trials across the South show that cotton growers who are battling nematodes can increase their yield and profit with an at-plant nematicide application. Nematode pressure can threaten the quick start that cotton seedlings need. An at-plant application of Velum Total nematicide reduces the nematode population density, protects the root system and increases the opportunity to develop a larger root mass, spurring strong early-season growth. In trials at Auburn University in 2016, Velum Total, on average, increased yield by 1,355 lb/A of seed cotton in reniform nematode-infested fields. In fields with root-knot nematode, Velum Total provided an average yield bump of 127 lb/A of seed cotton. Trials at the University of Georgia showed similar results, with fields treated with Velum Total yielding higher than fields only planted with a base seed treatment. Velum Total can also increase the opportunity for profit. Mississippi State University field trials demonstrated an average increase in profits of $435 per acre when Velum Total was used in the non-delta region of Mississippi. In addition to nematodes, Velum Total controls other early-season pests, such as thrips, and helps suppress diseases, such as Fusarium wilt – reducing the need for foliar sprays and saving growers time and money. Velum Total provides tough at-plant nematode control during the critical first 40 days of a cotton plant’s life. When applied in-furrow, Velum Total is effective at reducing the nematode population density. This helps protect and establish the root system, which is essential to supplying nutrients and water to the plant. Velum Total can be applied at site-specific rates depending on the nematode pressure. For more information, talk to your local Bayer representative or retailer.